Before joining Treehouse, Shuan dabbled in HTML and CSS but could never gain a comprehensive understanding of how to code. When an opportunity presented itself for him to combine his passion for helping young people realise their full potential with his interest in the web, Shaun enthusiastically took on the challenge. 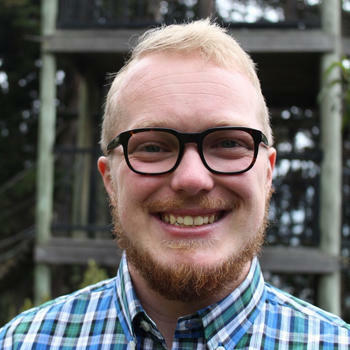 Shaun began learning with Treehouse while simultaneously redesigning a website for selfharmUK. It was the first website build that he managed, and the end result illustrates both Shaun’s talent and the impressive level his web skills have reached. Shaun also recently landed a full-time web developer position and is excited at the opportunity to further develop his skills. What first drew you to the web industry? When I was a child, my dad bought a PC for the family and this was my first opportunity to use the web for the first time. In fact, I remember a moment when my dad came running into my room after he received the phone bill; this was before internet was really available at a reasonable price… Oops! Ever since, I’ve been drawn to the web as a user but also as something that I’d like to understand better. What work were you doing when you first joined Treehouse & what encouraged you to learn with us? Before joining Treehouse I used to dabbled in HTML and CSS but I never knew where I could learn to code without having to read a very big and mind numbingly dull programming books. When I started working for selfharmUK I wanted to gain a better understanding, and much to my surprise, I rapidly became excited about how a few lines of code could return a cool feature on the screen. I think what really helped me progress with Treehouse was the way the courses were constructed. There’s a very accessible explanation of the terminology, followed by a demo and then a task. I’d tried many times to learn from programming books but they would only confuse me and would quickly become a door stopper. I’m a visual learner and the whole learning process really helped me. Tell us about the work you do with Selfharm.co.uk and the project to redesign their website. A few years ago, my wife and I were looking to move back to England from Colombia; which is where I’m originally from. Throughout my whole working life I’ve been involved with working with young people. When an opportunity came for me to combine my passion for helping young people realise their full potential and the web, I knew I had to get involved. selfharmUK is very passionate about creating incredible services that help young people take the first step towards recovery from self-harm and the way these services are delivered is via the web. One of those services is called Alumina which launched at the end of 2013. This is an online group that helps young people talk and get the help they need during a six week course. I’m still very much learning and I have a great employer who wants to invest time in me to improve. I’m really excited to see how I develop over the next few months. Since the project decided to change its name from selfharm.co.uk to selfharmUK, it felt right to re-design the website and start from fresh; rethinking the goals for the online side of the work. My job was to oversee the build of the new website. This was my first big website build that I’d managed. Before this, I’d managed a couple of site builds that only had a few pages to worry about; but I was really excited to take the challenge on. Although I wasn’t writing the code or creating the site proofs I felt that my role was very important; more so, on a big project like this. My goal had to be the end user. Pretty much every day I would be reminded about something the Nick Pettit had said about usability. I wanted an amazing site that looked great but if for some reason the site didn’t fulfill it’s aim, we would’ve failed. Thanks must go out to the young people we spoke to, the team members who encouraged us and proof read pages of copy, the designers who created countless page proofs, and the developers who created some amazing new features. I believe we’ve created an amazing website that really does help young people access the help and support they need. Many professionals around the world are talking about how the internet is an unsafe place for young people, but I’m very passionate about creating services that truly help young people. I’m excited to be apart of this but even more excited to see the lives of young people impacted. You recently landed a new job as a full-time web developer. Tell us a little a bit about it. As I’ve already said, I’m really excited about the way we use the web and the more I used Treehouse, I realised that I could actually create some cool sites too, so I decided that I wanted to commit to this. I love the challenge of solving a problem. My job is varied. One minute I’d be creating a HTML email and the next I’m diving into some jQuery. I’m still very much learning and I have a great employer who wants to invest time in me to improve. I’m really excited to see how I develop over the next few months. What has the value of a Treehouse education meant to you? Treehouse is the best online teaching recourse out there. It has not only taught me the basics of a language; but it also highlights the best practices of the industry. This has really helped in transitioning into full-time development. What are your plans for the future, and what’s up next on your learning path? I’d also love to start playing around with some backend stuff but for now, I think I’m happy with front end. Is there any advice you’d like to share with new students who are aspiring web developers? Commit to the whole Treehouse experience. When I used to find the challenges a little tough I’d normally skip them or just do a quick Google to help me get the answer; but the classes where I worked through the questions and went back to repeat a video to get a better understanding, were the classes that I got the most from. If you’re able to do this, not only will you learn very quickly but you will take the steps you need to start creating some cool websites and it could change the projection of your life. That sounds exciting right?